Today we are talking about how to build a team, a high-performing team that knows how to delight your customers on a regular basis. To dive into this topic, I chatted with Brandon Bruce, co-founder of Cirrus Insight, a fast-growing software company that reached #41 on the Inc. 5000 list. We can learn a ton from Brandon, including how he’s built and nurtured a team that enables his company to solve their customers’ problems like none other. Sonia Thompson: Hello Brandon, thank you so much for joining me today. How are you? Brandon Bruce: Hey Sonia, great. Thanks for having me. Sonia: My pleasure, all right, well let’s go ahead and dive right in. Tell me about your business, Cirrus Insight. Brandon: We started Cirrus Insight, amazingly, six years ago. It was the first application that connected SalesForce, which for those who aren’t familiar with it is a customer relationship management platform. We connected Sales Force with Gmail. We saw kind of a gap in the market where lots of companies were moving to Gmail, starting to use Gmail for their corporate email, and we wanted to connect it to their CRM system, so that it’d make it easy to do business. Sonia: Okay, and what was the specific problem that you solved for the people that you serve? Brandon: You know, for most of our users, our sales users, or other users that are customer facing, so they either have a role in sales, or what a lot of people call customer success, or support. For those folks, most of us, I’m a sales person, most of us spend a lot of the day inside the inbox, because we’re receiving communications from our customers and prospects. Brandon: So what we did, we took the data that’s in Sales Force and instead of having to go to a different web browser and look up your customer information there, we just automatically display it in a nice side panel inside of Gmail. We now do it for Outlook and for mobile devices also. For our end users, it’s really a big time saver. It’s not usual for a sales person to do, shoot, 100, 200 emails a day. Brandon: Instead, email me, and right alongside it, it says, “Okay here’s Sonia Thompson, this is the last time we chatted. We’ve got an open opportunity, but I also need to solve a case.” So all that data just flows into the inbox. It’s a big time saver. Sonia: Absolutely. Something as simple as managing where you’re able to see all the information makes the customer experience that much more beneficial, but also, like you said, it makes you much more productive, and efficient as you’re going through your day to day tasks. Brandon: Yeah, we live in an era of distraction in a lot of ways, right? I mean, the phone is going to be buzzing, and dinging, and we’re going to get Slack notifications. Brandon: We’re going to get Facebook Messenger notifications,like stuff is happening all around us all the time. The phone is ringing, so the extent that we can make a single workplace really productive, so that you’re not constantly switching context between, now I’m looking at the inbox, now I’m going to look over here and look at the CRM and now I’m going to come back. If we can get rid of all that, and just focus on replying to the customer to the best of our ability with full knowledge of what that customer relationship has been like in the past and what we want it to be like in the future, that’s a big win for those of us that are trying to communicate in the right way with our customers. Sonia: For sure. Are there other business that do what you do now? I’m trying to wonder, why does it that your customers choose you? It’s easy if you’re the only one but, why would you say that they choose you overall? So we were the first to market and that helped because there were a lot of early users that just said, “Yes, we’ve been waiting for this” and bought it. And a lot of those are still customers which is awesome. But yeah, in an increasingly crowded marketplace which is the world of software, it moves fast and there’s lots of competition which is good for end users. People will still choose us, if they’re SalesForce customers they choose us because we have the best SalesForce integrations out there. So yes there are other customers, yes you can save e-mails to SalesForce, yes you can sync your calendar, but we have this really deep integration where if you’ve really built out your Sales Force experience with custom fields and record types and custom objects and this is how your business runs, then we’re the best company that connects that with your inbox and calendar experience. If you’re not using Sales Force then we now have an application that supports non-Sales Force users, so for that people tend to be using Cirrus Insight because of the breadth of our platform. So you can not only track your e-mail opens and your replies and use e-mail templates but we also will track your attachments. You can also schedule meetings faster, so it’s like potentially lots of different apps but we’re combining them into all one platform which makes it easier for the user. They don’t have to do any integration, it’s just install, everything works, voila. Sonia: Beautiful, beautiful. Now what does a remarkable experience mean to you? I kinda have an idea based upon the way your product is developed and how it helps your end customers. I’d love to hear it in your own words, what does a remarkable customer experience mean to you? In a lot of ways though, I think today a remarkable customer experience starts with really meeting the customer’s expectations. They’re coming in, they’re thinking, “I’m a skeptical customer because there’s so many things that are available now to buy and there’s so many people selling at me all day. I’m gonna tread lightly before I take my wallet out.” And so then the question is, okay, if I’m expecting to get a certain thing from this product or service, does it in fact deliver that. And that I think is the beginning of a remarkable experience, where it’s just, “We see you, wee see what you want and we’re gonna deliver that to you.” And then it gets really interesting when as a customer, if I want something, if I’m like, “This is great, and it’d be great if you also did this” and the platform then delivers that back. That’s exciting. Because it’s not a stagnant world, we’re always wanting more stuff. We want more features, and if a company can keep up with that and deliver back to the customers what they’re asking for, then you’re in a really, really nice feedback loop. Sonia: I like the way you describe that because I think a lot of times whenever people are thinking remarkable and how to delight their customers, they jump at the over the top things right away in terms of what they can do. But like you said before, there were two probably very good products, there was Gmail and there was SalesForce that people were very happy with, but there was still an unmet need that existed. So filling that basic, unmet need, from a basic level you were able to help your customers feel like, “Oh great, this is wonderful. This is better than anything I’ve ever had before.” And that in itself is remarkable. Brandon: Yeah, that’s been one of the great things, I think, for our business is that we’re connecting tools that generally people really like. They’re using Gmail, they’re like excited about it. And then it’s like, “Yeah, we’re using SalesForce.” SalesForce brings almost 200,000 people to San Francisco every year for a big conference to celebrate what is at its core a database. I mean, that’s remarkable. And so if we can make their jobs a little easier, help them work a little bit faster, then they’re overjoyed with our offering. And yeah, to your point, we’re moving offices this coming week, we had cable internet installed and the cable industry gets hit a lot, right, online, for hey, service, service, service. But they sent me a survey afterwards, “Hey are you happy?” And I said, “Yeah, I’m really happy.” And it’s like, “Well, why?” It’s like, “Because it got installed on time and then you sent me a message that said, ‘It’s installed and we were on time. '” And I was like, “That’s a remarkable experience.” Because I expected it to get installed on time, but it actually did happen, and so I’m like, “I’m very happy about that.” And it wasn’t because the internet’s 10 times as fast as I thought it was gonna be, it didn’t exceed some sort of mythical expectation, it’s just because someone said they were gonna do and then they did and I’m like, “Great.” I’m happy. Brandon: And the world’s right. Yeah, simple. We make it harder than it should be most of the time. Sonia: We do. What kind of culture do you cultivate within your company that makes it so that delivering remarkable experiences for your customers is their norm? In that you have an environment that is conducive to being able to deliver it? Brandon: I read in an article recently one of the original founding principles at Facebook which was there’s nothing at Facebook that’s somebody else’s problem. I love that. That’s so smart, right? Because stuff’s going to happen in our day to day lives, our personal lives, our business lives, but in a company there’s going to be lots of stuff that breaks all the time and then you have people there that are constantly trying to fix it. And I think if we all adopt the, “Hey I see a problem, but that’s not the support team’s problem, or that’s up to sales to solve that, or product needs to do a better job”. Anytime I think that we’re tempted to say, “They” or “their” or “them,” if we replace that with “me” and “my” and “I,” take some personal responsibility for it, shepherd it, then the customer wins in that situation. Because everyone, it’s not like, “Oh, well that’s a product problem. And I don’t work in product, right, I’m just on the support team so it’s not me.” It’s like, “No, we’re all in this together, so that’s my problem now and I’m gonna own it and shepherd it in for the customer.” That I think makes for remarkable experiences because we are used to now in a world in which we call in to a toll-free line it’s a phone tree. Well, I don’t know, thanks for all your information I’ll pass you along to another person so you can do the same thing again, maybe do it five or six times. So what we try to do and it’s something that all of us could always do better at, is take that responsibility for saying this is my company, this is my application, these are our customers, they’re shared, and we’re going to do everything we can to help make them happy. Most of the time as a customer when companies treat me that way, I love that. Sonia: Right, I do too. Sonia: For sure. How do you, because I imagine when people work at different companies it doesn’t always, the norm in most instances probably isn’t for them to operate in that way where people are thinking about problems that they find as something they can own and carry through and champion. So how do you get your team to not think in silos as to this is somebody else’s problem versus this is something that I’m going to carry through for the customer? Brandon: I think it’s hard. I think it’s constant. I don’t think it’s one of those things you put up on a poster and everyone’s like, “Yeah, of course. We’ll just do that.” Because all of us are tempted to delegate off something and that’s important, we all need to be specialists on the one hand and do our role but be generalists enough so that we understand, have empathy for everybody else’s role, and we can fill in. So I think even some of the things that we’re trying to do now, and this stuff sounds silly but it makes a big difference. We’re on two floors right now and I started to notice there’s a gap, people wouldn’t just hustle up and down the stairs to chat with each other. So we’re moving to an office where we’re all going to be in one open workspace. And I think that by itself is just gonna help so if we see somebody like, “Oh man, it sounds like they’re struggling a little bit on this call, I’m gonna go sit with them and help them out.” But if they’re siloed in their own office, then that becomes a personal struggle. They’re on their own because nobody is there watching it happen. Sonia: Got it. Now, what do you do to maintain the level of intimacy with your customers that helps you know what it is that they need most for you? Even sometimes before they actually are able to articulate that to you. How are you able to stay close to them? Brandon: The best thing that I think we can do is keep the channels of communication open. Which isn’t to say there’s constant communication because frequently things are just copacetic. It’s like, “It ain’t broke, let’s leave it alone, everyone’s happy and we don’t need to be badgering anybody.” But to make ourselves available. If someone wants to book time on our calendar, here’s our calendar and you can book time on any time you want. You don’t have to contact us first, you don’t have to call or e-mail, you just grab time on the calendar and we will show up in that meeting room and we’ll be there to chat. Sonia: Got it. 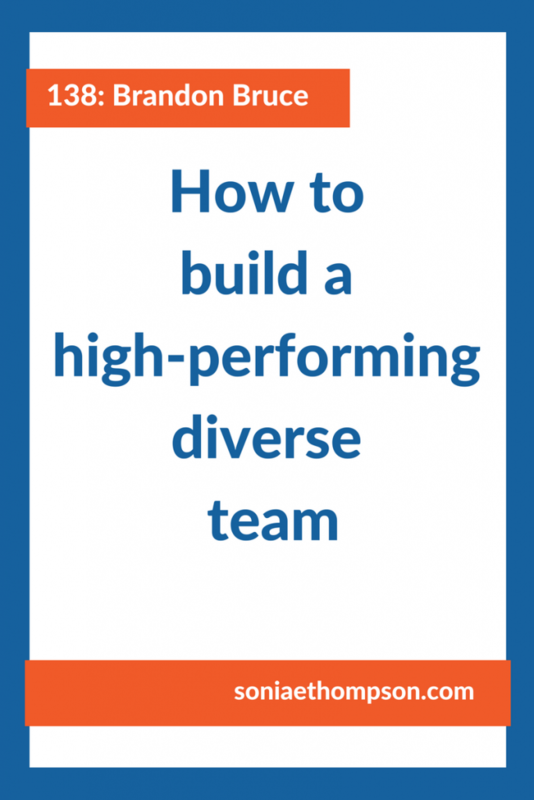 How do you use diversity to your advantage? Whether that’s diversity on your team or diversity in terms of how you serve your customers to be able to be more competitive and be able to solve their problems who do what you do are able to do. Brandon: Yeah I mean if I abstracted a little bit, and my brother’s a philosopher, so we’ll look at kind of the definition there. Diversity’s something that means difference and difference we all know is interesting. It’s interesting to be different, so we as a company, and I’m in Irvine today and this week with our engineering team. But I’m based in Knoxville, Tennessee, so our whole Sales Marketing and Operations team is in Knoxville. That’s different. People don’t expect that from a cloud software company that’s got 5,000 plus customers and a couple 100,000 end users, to be based with a center of operations in Knoxville. It’s a growing community of software companies but there’s not that many of us. People generally think we must be based in San Francisco, or Austin, or New York, or Boston, or something like that, which are all awesome cities. But yeah they think that, “Well that’s interesting, so you guys are in Knoxville” and we kind of bring that very personal approach to doing business. So if they’re also in the Southeast then we share something in common, or if they’re in Europe we’re a little bit closer to their timezone. So it just creates a point of conversation. And having a team with folks with lots of different backgrounds. I think one of my favorite things of being asked on a panel once, “What’s your prototypical salesperson hire?” And I was like, “I wish I had a better answer for you, but we don’t have one. One of our top performers spent 17 years as a chef.” How do you template that? How do you say, “Well we’re going to a hire a sales team, let’s find people that have spent a couple decades in food service”? These are just interesting individuals, they have majors that range from Business and Sales and Marking to, a lot of our folks have studied Theater, Language Arts, Math, some Computer Science, of course, but it’s that breadth of experience, whether it’s in academia or just life experience or where they live or if they’re a man or a woman or what color they are, all of that informs how they come to work and how they relate to customers. And I think that makes us, and it makes every company interesting. Sonia: Yeah, I like how you brought that up, everybody’s got like a… there’s no template sort of what makes somebody your perfect or ideal candidate because everybody’s got these different walks of life, which you said. It’s a beautiful thing, it’s not boring, and it helps them be more relatable. Do you have to encourage your team to tap into their unique backgrounds and strengths to be able to do their job more effectively? Is it something that you feel that you actually have to work to pull out of them so that the team is able to have a more synergistic effect or do they do that sort of on their own? Brandon: I think it’s something that we all have to remember. It’s one of those things that a lot of the people will talk about in Ted Talks and other things, starting with the beginner’s mind. Right? Approach something like a two year old and ask why lots of times. And sometimes we can all get into a rhythm where it’s like, “Well I’m demoing our software product again, I think I’m going to demo it just like I did the last five times in a row.” So you just go straight into it like, “This is where we start and this is where we end.” But it comes across and it feels a little bit rote and so we have to remember I think to connect with people as people. Like, “Yes, we’re going to talk about software on this call. But first, yeah, it’s like, where are you from? I saw in your LinkedIn profile where you went to school so that’s really interesting, we used to compete with you guys back in high school, and it’s like, really?” I mean, I can’t think of the last time I met somebody where there wasn’t something there, including a pitch I did last week in Knoxville, and we just ended up saying, “Well I’m heading out tomorrow morning in Irvine to work with our engineering team” and the person said, “I just moved here from Irvine.” And I was like, “Well, that’s unusual” right? And yet there’s always something that you have in common. He said, “Oh, well my family’s originally from Thousand Oaks.” And I said, “Well my dad works for Amgen which is one of the biggest employers in Thousand Oaks.” So all of a sudden we’re talking and the meeting was over, I was trying to move us out of the room but that’s when it got really interesting, when the pitch was over. That I think makes business fun and I think it’s really important to do, not just for the sake of hey let’s build a relationship because we’re trying to close a deal but also because it makes life interesting. Sales is a relatively high turnover type of job, so is support, so it’s like, “What are ways we can find for ourselves and our team to enjoy the process?” And some of it is just making that connection so that every support call doesn’t feel the same. It’s like, “Yeah, I helped you solve your issue, but more importantly, I heard from someone today that’s from Iowa. It’s fascinating. They usually get a ton of snow this time of year.” It makes a story. Sonia: For sure. And I love how you said it’s just about being human and I think a lot of times as people are doing business, sometimes they forget the human aspect of it. They’re so focused on being professional or the transactions but being human and treating other people as humans and the way that we would want to be treated ourselves makes such a big difference in tearing down barriers and having that sense of connectivity with our customers that so many of us crave. Sonia: For sure. What are your three keys to success? Brandon: Oh, good question. I think one of them, and this goes back to when I was really little and it’s fun now to see my kids who are six and eight do this, but I’ve always been a reader. I love books. I love reading almost anything and everything I can get my hands on, so while I have read a lot in the business field and I went and got my MBA years ago, I think reading in just a really broad area of stuff you’re interested in. So some of the books I love the best are about physics, anything written by Richard Feynman I think is fascinating. Stuff I’ve read recently is by an author named Father Gregory Boyle, who founded Homeboy Industries in Los Angeles. He has two books out now and I recommend those to anybody that might be watching the video. Awesome, awesome books. So, yeah, reading I think is definitely a key. I’ve enjoyed especially the first few years we were really just heads down and we didn’t pay attention to really anything that was going on except for trying to get the business off the ground. Since then we’ve been pretty intentional about being very active in the community. Just getting involved in lots of stuff. So we go out and volunteer and stuff, we support things, initiatives, projects, charities, financially. That I think is important. And I think there’s an aspect of well it’s great for networking, and you get the word out about your business, and all that’s true. But I wouldn’t do it for that reason. I think those are natural consequences of just being visible. But I do it just because it’s fun. I mean, I think it’ll help make you… It won’t necessarily make you successful, but it makes you feel successful if that makes sense. You don’t actually have to be quote-unquote that successful as a business, as a person per se, from a financial perspective, to go out in the community. But if you’re very active people will say, “Oh they must be really successful, they’re out there. They’re doing stuff.” So I would include that one. I’m trying to think of a good third one. I think as a corollary to being involved in the community, staying real close to the team. We’re a small company, we built up a team of folks that we really like to work with. That’s been part of the fun about being an entrepreneur, is that you get to go out and choose like, “Hey, let’s all work together.” So there’s no forced situations where you find yourself like, “I’m in this huge company and there’s a bunch of people who don’t like me and I don’t like them and it’s getting awkward.” We’re all choosing to be here, and we all like it, and it’s remembering to keep cultivating those relationships. I think, I forget who said it but someone said, “Yeah, you hire an employee and a human being walks through the door.” Because you’ve hired based on a role, like this is gonna be your job title and this is your job description and we need someone that fits this profile that has these skills and talents. And then someone comes in and it turns out they’ve got all sorts of interests and family background and they’re from different places and it’s remembering that. We try to do that with the Friday lunch every week, and we had opened that up for a time to the community and we’ll do that again. So we’ve had hundreds of people join us. Sonia: Sweet. Where can people find you if they wanna learn more about your software and just your company and all the things that you guys are doing? Brandon: Yeah, thanks, we’re at cirrusinsight.com. C-I-R-R-U-S like the high, wispy clouds, although last year somebody introduced me as coming from Circus Insight, and I was like, “That sounds like an awesome company.” But we’re cirrusinsight.com, I’m on LinkedIn, I’m pretty easy to find, so Brandon Bruce. And we’d love to hear from folks. Ifyou use Gmail which many of us do, whatever half a billion of us or more do, then check us out. We’ve got a free trial. We’ve got a great team that can help you navigate it. And if you find yourself in Knoxville, Tennessee, then I’d say come by the office and we’ll take you out, show you a great smokies, and show you around town. Sonia: Sweet, I’ll have to do that. I’ve never been to Knoxville, so I’d love to stop by. Brandon: Many people have not and more people should come. It’s a great place to visit. Sonia: Sure, any parting words of wisdom for business who want to consistently deliver remarkable experiences for their customers? Brandon: That’s a great question. Honestly, I love the title of the show. I mean if we think of ourselves as a magnet, then it means that you’ve just got a constant force, right? Magnets don’t, unless some other force is applied to them, magnets keep exerting their pull. It doesn’t stop. And so it’s like, turning it on and figuring out ways and strategies to keep it on. That’s the big danger for any of us as we start something and we get distracted and we go do something else and the magnet stops pulling. Just keep the energy going to the magnet and it’ll be alright. Sonia: Got it. Alright, well before I let you go I have one last question just to dig inside your mind a little bit more and that’s to deliver a line from a movie that speaks to you and explain why you chose that one. Brandon: Oh man, there’s so many good lines. Some of them don’t even really have words, right, I’m thinking of like, Bill Murray cleaning the pool in Caddyshack, right? And it’s like, he didn’t say anything! But that went a long way. But yeah maybe we’ll choose a Bill Murray line, when he goes out and he’s kind of whispering to himself and he’s setting the golf balls in little tufts of flowers and then lopping off the flowers but he’s got this good mind music going on, where he’s talking about the last hole of a big championship and winning the championship. And that’s good for business, right? You gotta talk to yourself a little bit and say, we’re going big. This is gonna be okay. We’re gonna go the distance. We’re gonna win the championship. And that’s what his albeit strange character in Caddyshack is doing. So that’s a throwback, that’s dating myself, but anything with Bill Murray in it is good with me. Sonia: Very cool. Brandon, this has been so much fun. Thank you so much for stopping by and sharing your experiences with us. Brandon: Thanks a bunch, Sonia. I really enjoyed it.